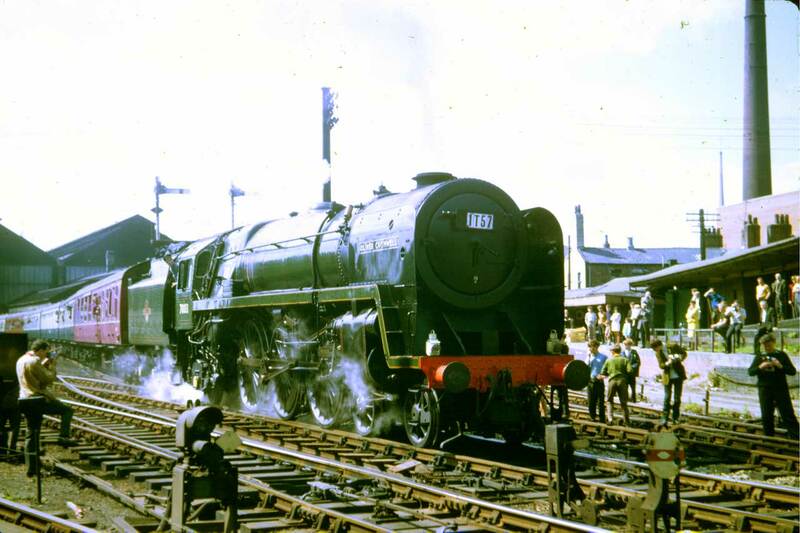 Sunday the 11th of August 1968 was indeed a significant day on British Railways. 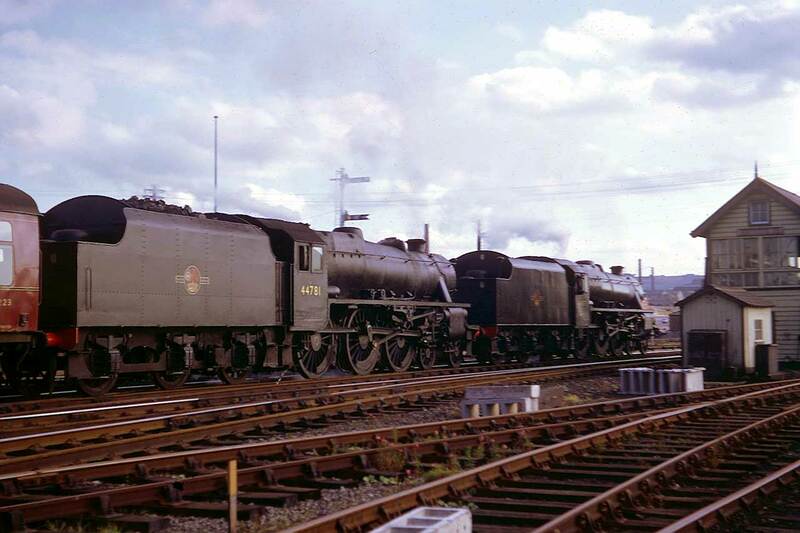 This day saw the elimination of main line steam hauled trains in Great Britain. 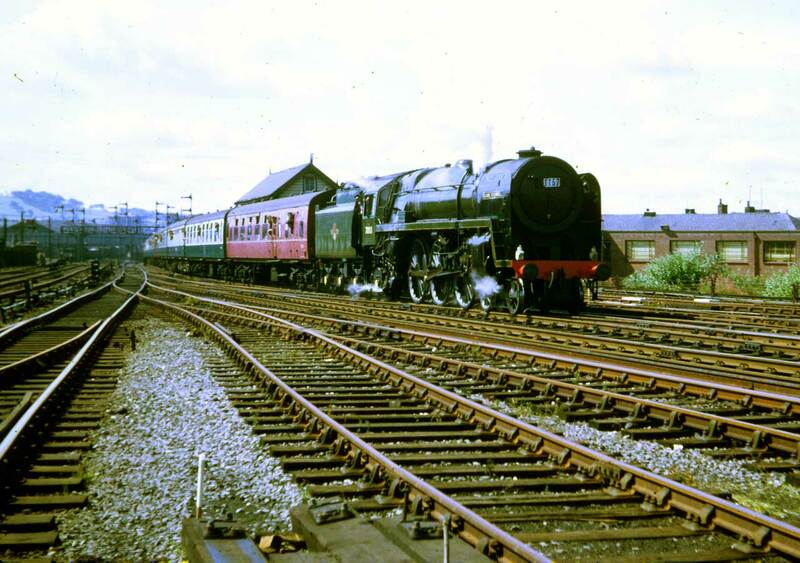 The final excursion, 1T57, known as the 15 Guinea Special, operated between Liverpool Lime Street (dep 09:10) to Manchester (arr 10:36, dep 11:06) to Carlisle (arr 14:56). Return departed Carlisle (dep 15:30) to Manchester (arr 18:48, dep 19:02) and to Liverpool Lime Street (arr 19:50). There were the scheduled times but these timings went well astray due to enthusiastic crowds all along the route. 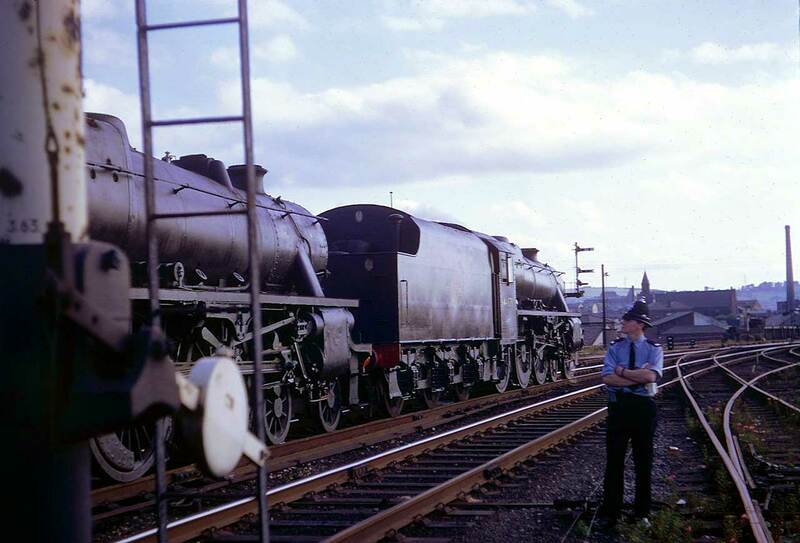 From Manchester to Carlisle the train was hauled by BR Standard pacific "Oliver Cromwell". 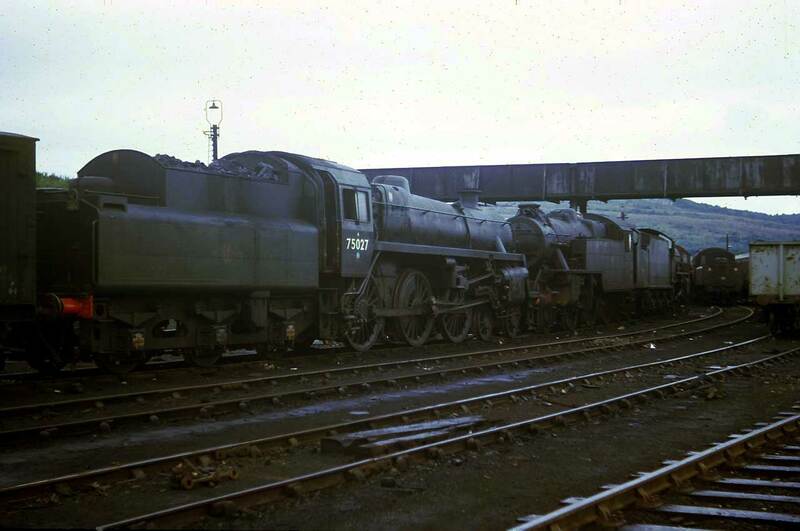 The returning Carlisle to Manchester train was entrusted to a pair of Black 5 locomotives. 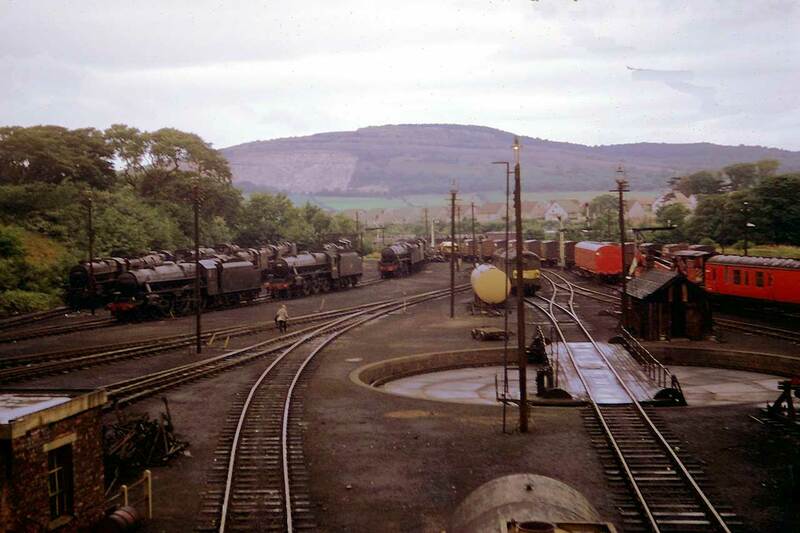 After the 11th of August 1968 the only place to see mainline BR service steam locomotives was in various graveyards such as Carnforth. These scenes here are all from mid August. Being summer time in England, the weather was severely inflicted with precipitation. 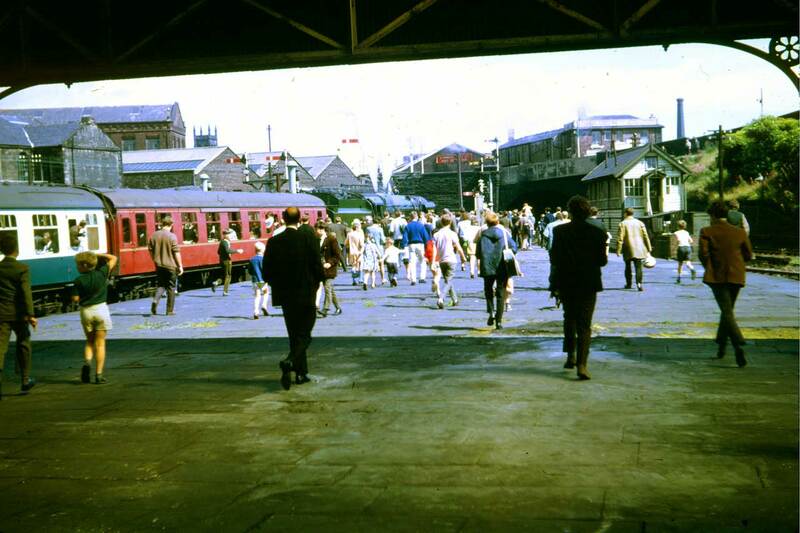 Sunday the 11th of August 1968 has arrived and we are at Blackburn, Lancashire. The final outing of British Railways mainline steam northbound with "Oliver Cromwell" in charge arrives for a water stop. Slowing for the stop at Blackburn, the locomotive passes the south water crane. Take note, this water crane will become crucial later on. 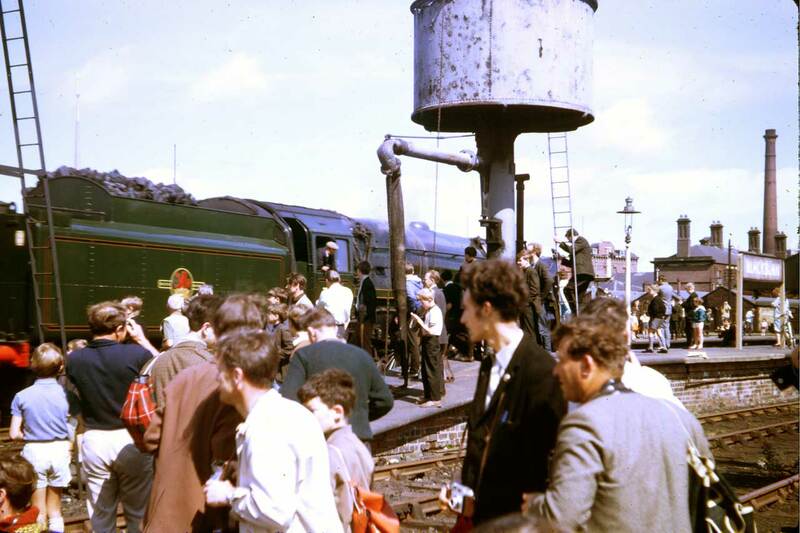 Once the train had stopped most of the audience relocated to the north end of the station. 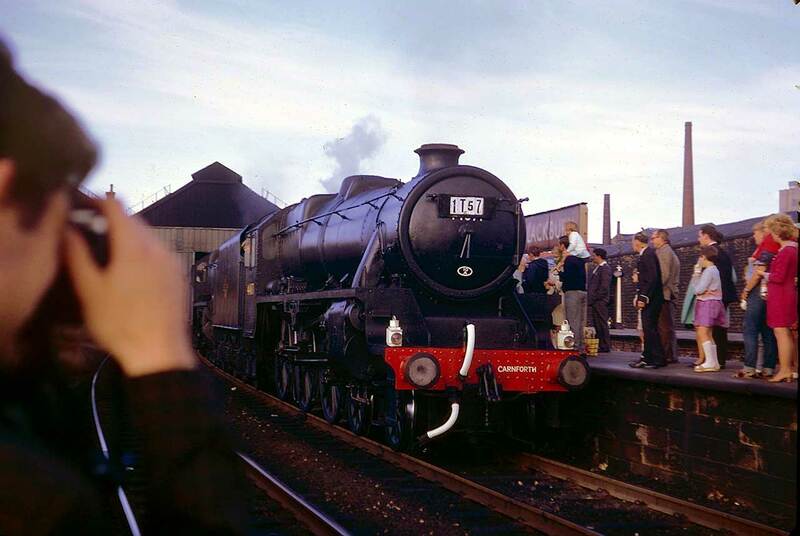 At the north end of Blackburn Station, an attempt is made to quench the thirst of "Oliver Cromwell". Unfortunately the well was dry. At that time staff were not afraid to use their initiative and the problem was quickly eliminated. 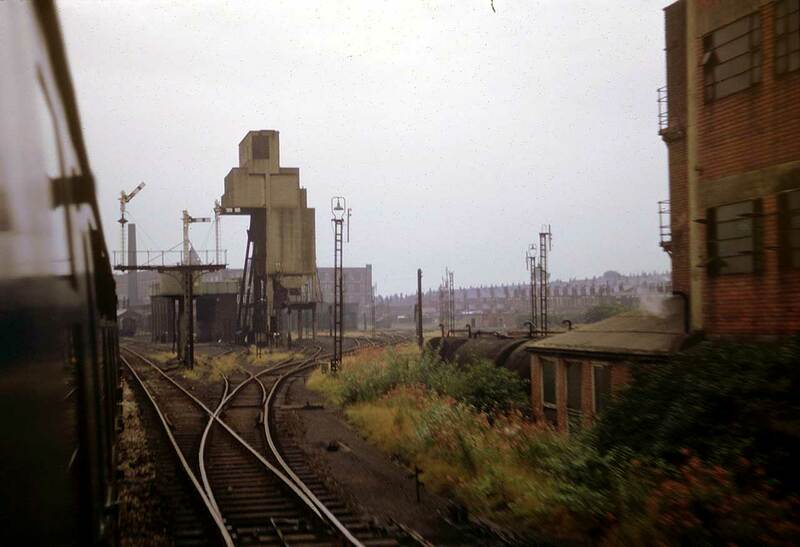 With the cooperation of the two local signal boxes, the loco was detached, ran round and went seeking water at the south water crane, seen above. 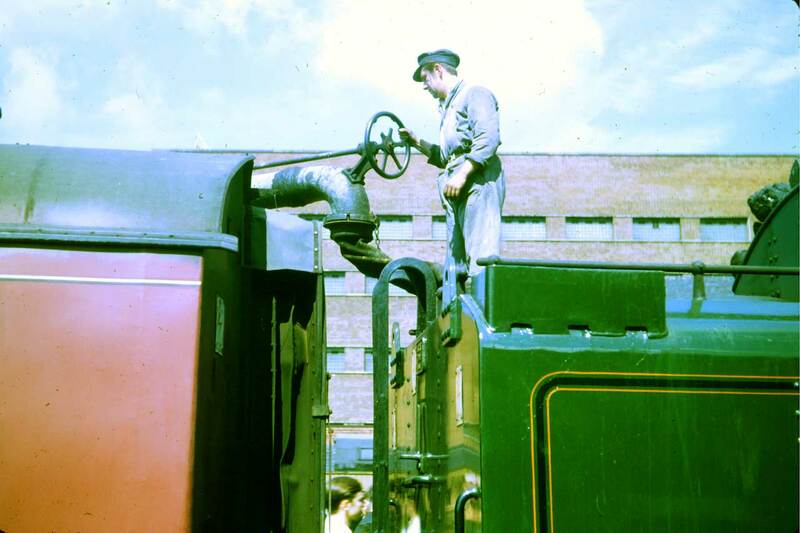 Once replenished, the loco was reattached and the onward journey resumed. Now with a fill of water the train departs for Carlisle. Had this problem with the water taken place in the present day and as personal local initiative is forbidden, the 'Elf & Softie zealots would have cancelled the whole excursion. As to allowing people without having partaken in a formal training course, possessing a certificate, signing a waiver and wearing a Hi-Vis tabard to climb signals to take photographs, well! Departure takes place somewhat late due to the water incident. Note that the locomotive nameplate has already been squirreled away and replaced with transfers, no doubt to circumvent light fingered metal thieves pursuing their nefarious trade. 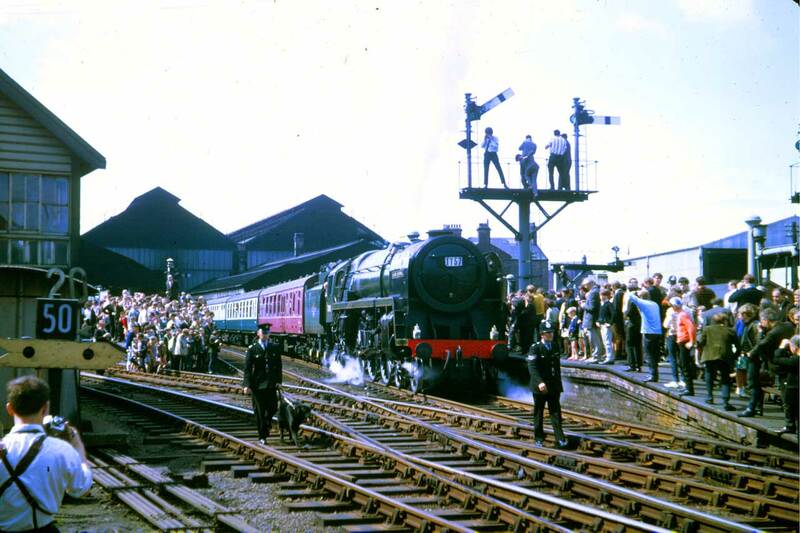 The southbound train is arriving at Blackburn where an enthusiastic crowd remained to watch this momentous event in the history of British Railways. Despite the crowd seen for the outward journey, Lancashire Constabulary appeared to now only provide one officer to maintain order for the return working. At this point it seemed that a decent viewing of the train was going to be impossible due to the presence of the solitary officer and this seemed like the best we were going to achieve. Fortunately a very orderly crowd managed to overwhelm the lone officer and much better viewing locations suddenly became accessible. Once again common sense prevailed and no one encroached anywhere near to the main running lines. How much more pleasant pictures look without mass infestations of persons with their exuberant use of high visibility outfits no matter how insignificant their function may be. This is our last view of live steam locomotives in British Railways service and the final train departs for Manchester and Liverpool. The end of an era. The week following the end of steam we are on our way from Preston to Manchester to change to a train to Sheffield via Woodhead. 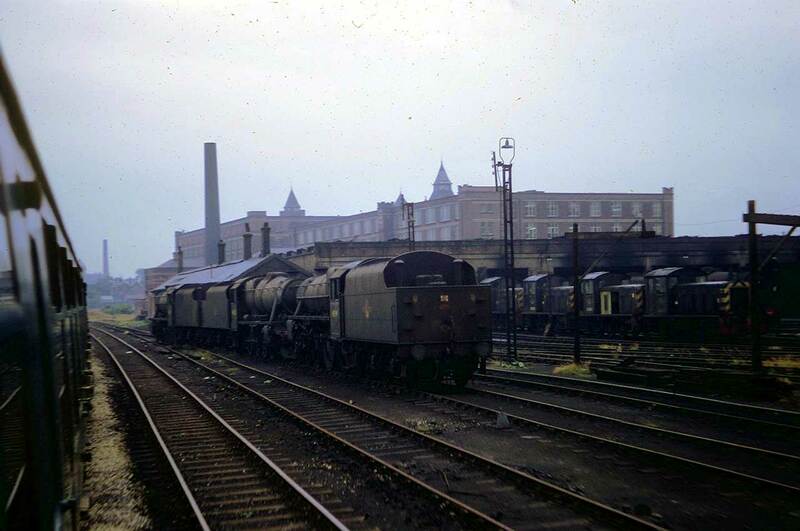 Here we are passing Bolton engine shed and there is no sign of any activity. Bolton again and all is quiet. Travelling on a classic Diesel Multiple Unit there was no problem dropping the window on the door and leaning out, an opportunity sadly not available to present day railway photographers. We are now at Carnforth. Once again access was not a problem. All the steam locomotives are dead and awaiting disposal. We were however not too welcome to photograph the Co-Bo locomotive as the chaps were trying to revive it and bring it back to life. They might have been more successful if they diverted their attention to one of the Black 5's instead. The Co-Bo would not live on much longer. 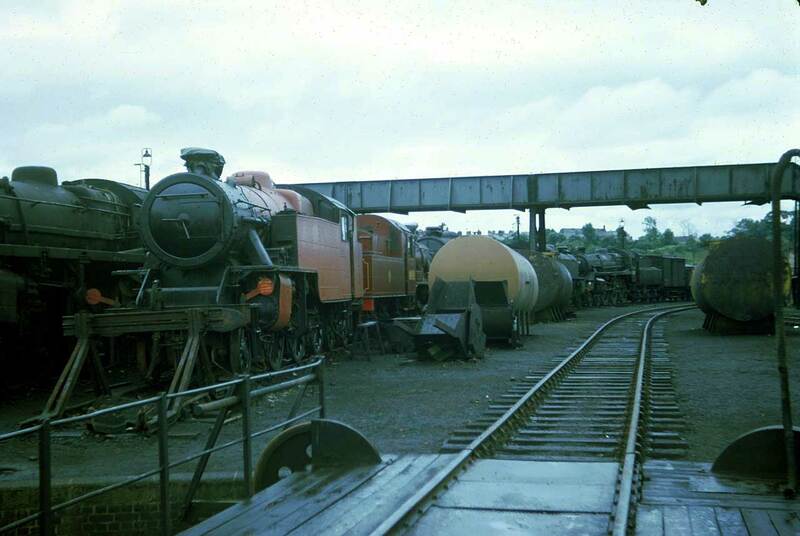 Not all the locomotives would suffer the fate of the Class 5's seen in the background and some would be restored and survive in preservation. 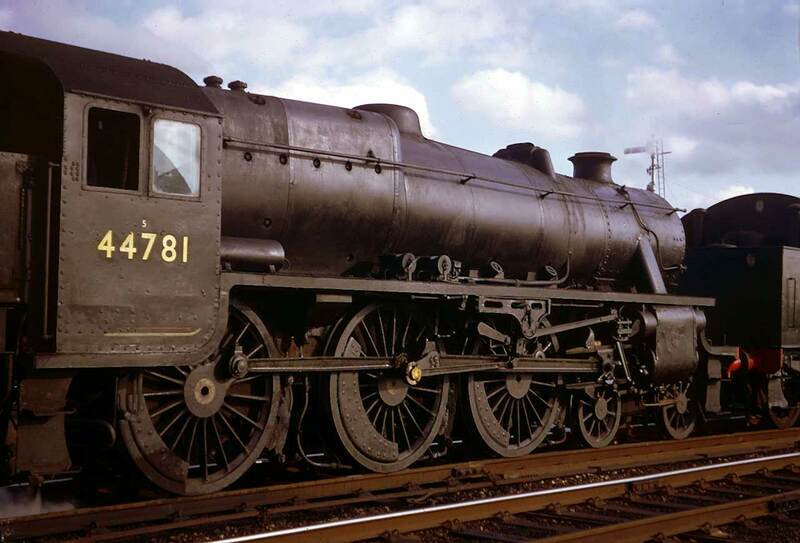 It may look like a normal BR Standard 9F but that is not quite so. This appears to be 92167 which was originally mechanically stoked. 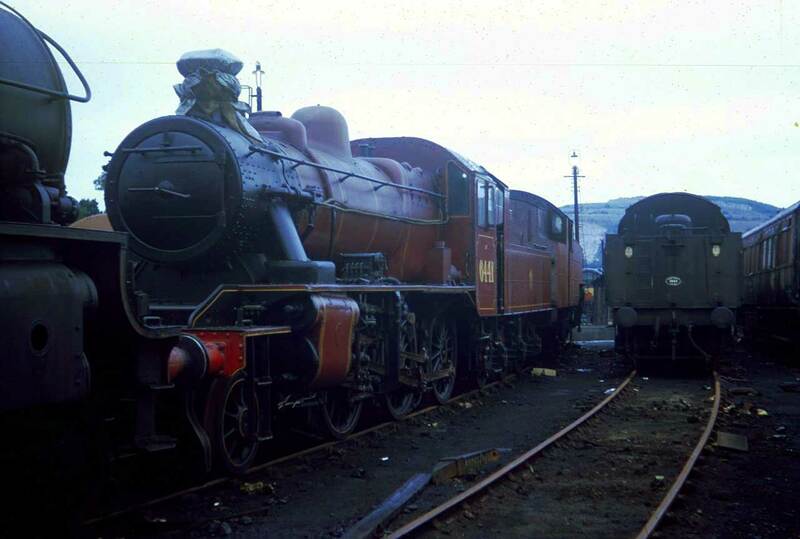 The stoker was subsequently removed but another more unusual experiment took place, it was converted from a 2-10-0 to a 2-8-2 and ended its in service days as such. The vultures have already swooped and parts have started to vanish from what looks like a perfectly serviceable locomotive. Once again parts have already vanished. 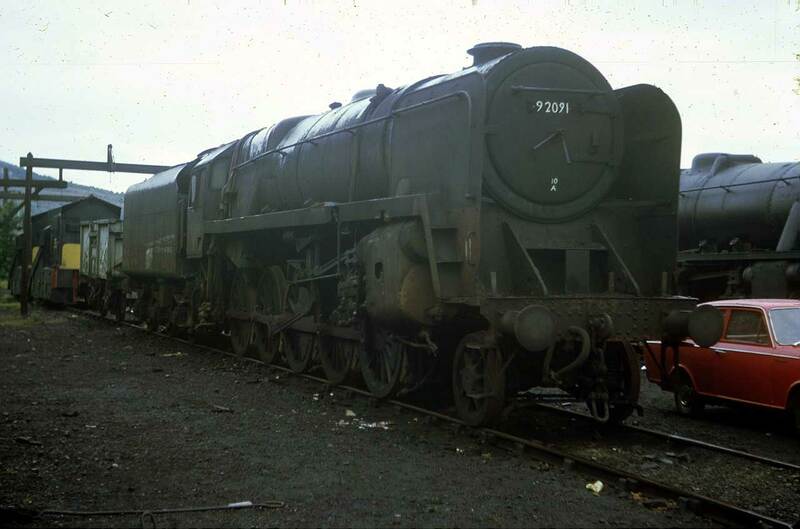 BR Standard 9F 92091 is a single chimney 9F which was scrapped in November 1968, just 12 years after construction at Swindon Works. No doubt the adjacent Vauxhall Viva HA is no longer with us also. 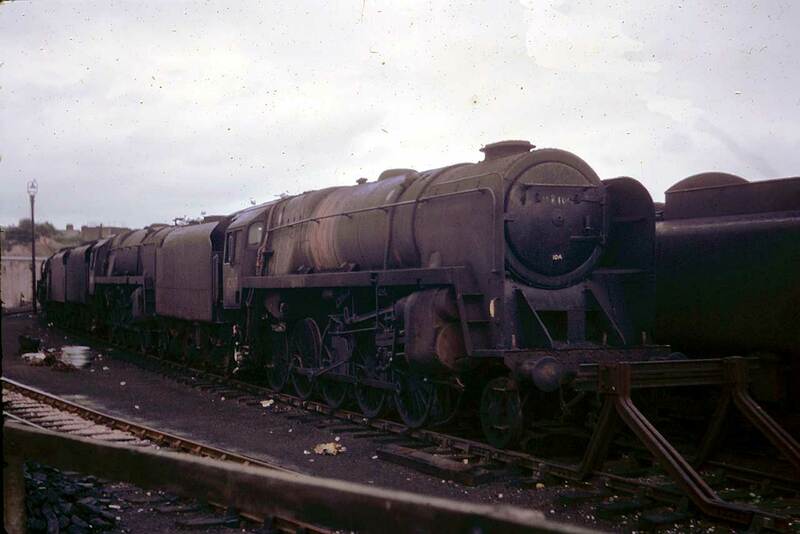 BR standard class 4, 4-6-0 one of a number fitted with a double chimney from 1957. 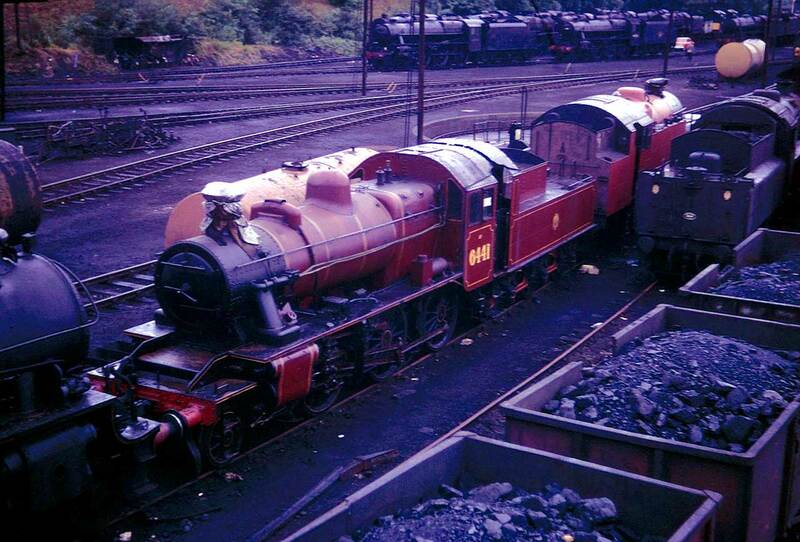 This is an Ivatt class 2, 2-6-0 in a non-authentic LMS crimson lake livery. 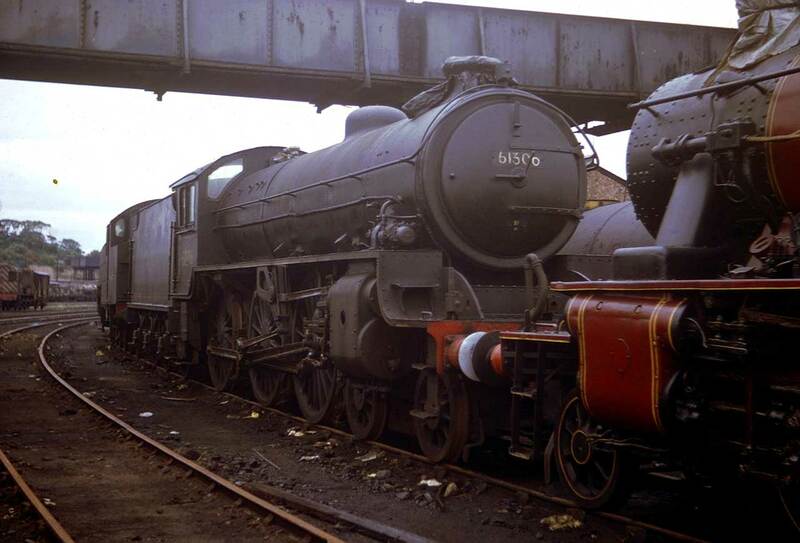 This locomotive has been repainted in BR maroon and carries the number 46441 and now resides at the Ribble Steam Railway at Preston, Lancashire. 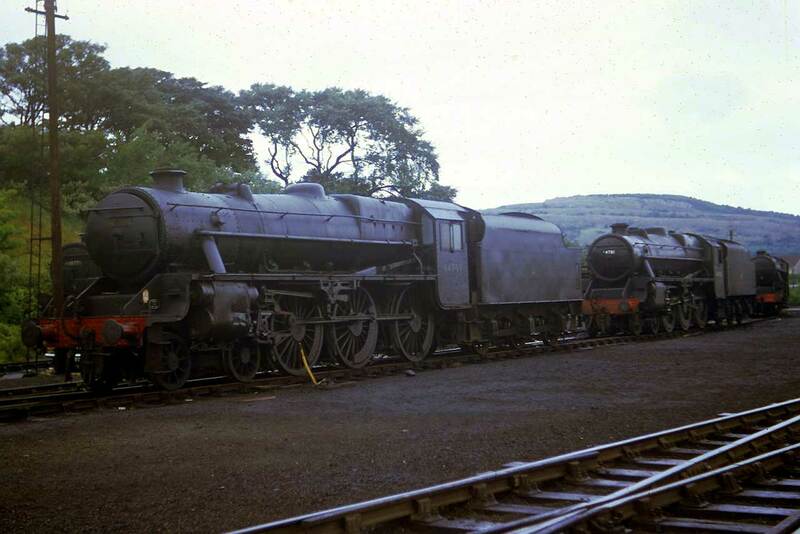 Most of the locomotives in the graveyard at Carnforth were either ex LMS or BR Standard types. Alone amongst them stands a foreigner from the east. 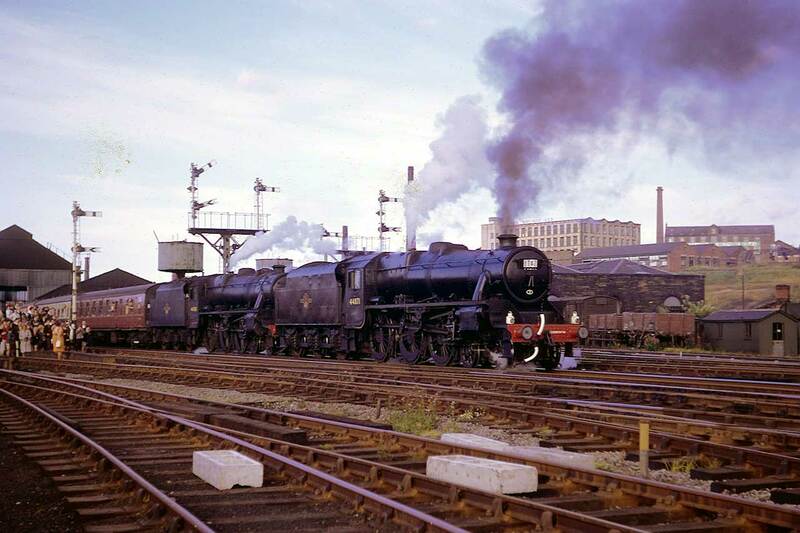 BR standard class 4, 4-6-0 75027 with a small BR2 tender was initially allocated to the Western Region where it was turned out in lined passenger green. The blue disc on the cab side indicates its Western Region route availability code. This locomotive is now preserved on the Bluebell Railway. 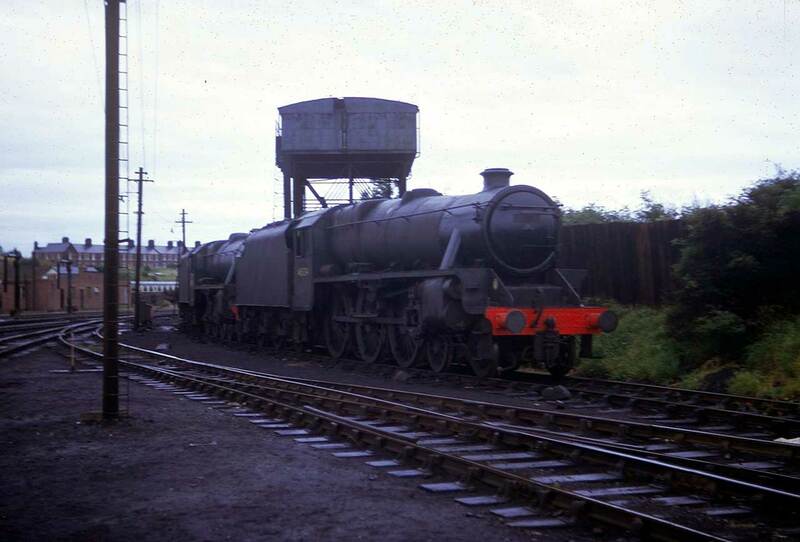 A Fairburn 2-6-4 tank locomotive. 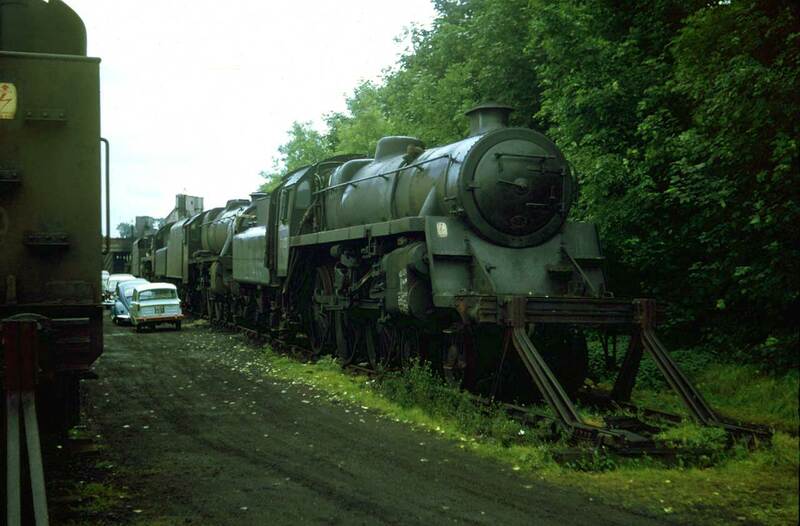 One of a pair that now work on the Lakeside and Haverthwaite Railway in Cumbria. 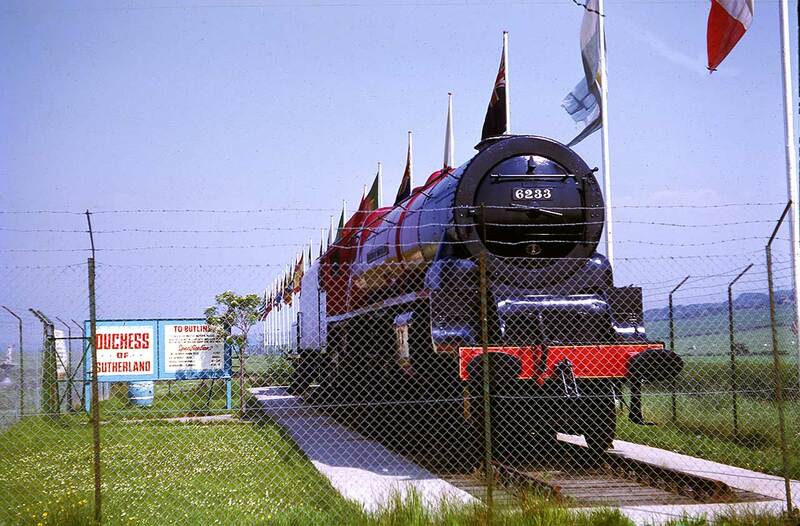 Some steam locomotives ended up in some unusual places. 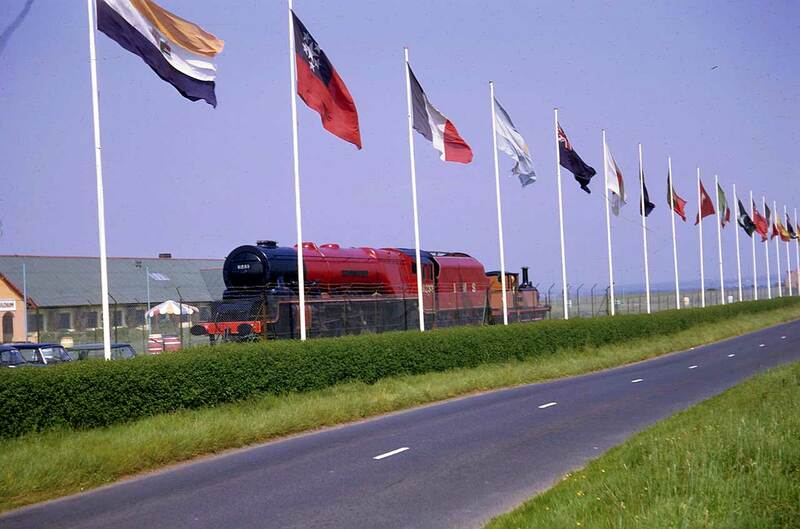 This scene is at Butlin's holiday camp at Heads of Ayr, just south of Ayr. This is Duchess of Sutherland. July 1969. Duchess of Sutherland was subsequently released from captivity and is back in operation in the wild. July 1969.